Some forage producers do little to control weeds in their perennial forage fields and pastures except maybe cut them when it’s time to make hay. Others are vigilant in their approach to keep undesirable species out of their forage fields. When they significantly reduce the feeding value of harvested forage. When they begin to out compete the desired species. When weeds aren’t tolerated by those who are purchasing the forage, thus eliminating your client base or reducing forage value. “Weeds compete with forages for moisture and nutrients,” said Vanessa Corriher-Olson, a forage specialist with AgriLife Extension at Texas A&M University. 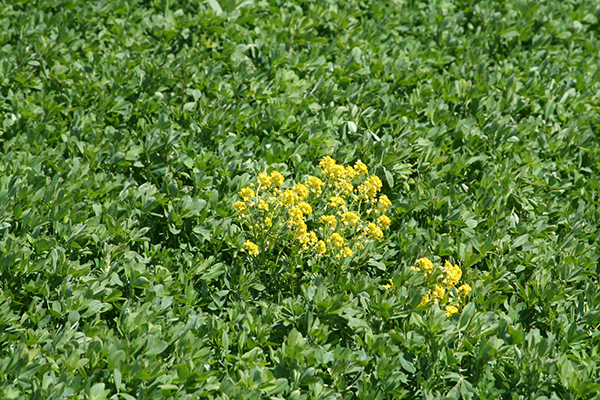 In a recent AgriLife Today news brief, Corriher-Olson noted that the best way to control weeds is simply to do everything you can to promote excellent forage growth. If cultural practices won’t work, then it may come down to using herbicides. “Identifying the weed is the most important consideration when applying herbicides,” said Corriher-Olson. “It’s important to match herbicide effectiveness with the weed species needing to be controlled,” she added. Though there are many effective herbicides for forage fields and pastures, not all are labeled for every type of weed or forage species. Further, some pasture herbicides have livestock withholding intervals. A supplemental label has been added for Prowl H2O herbicide that will allow its application to some additional warm- and cool-season grasses. The label now allows producers to use the herbicide on solid stands of perennial forage grasses such as bromegrass, tall fescue, timothy, orchardgrass, perennial ryegrass, bentgrass, Kentucky bluegrass, and switchgrass. It can be used on forage harvested for greenchop, silage, dry hay, or pasture. According to Penn State University weed specialist William Curran, the label change will allow for better control of weedy annual grasses such as crabgrass, foxtails, panicum, and other species that are problematic in grass fields. Prowl H2O can only be applied to established perennial cool-season grasses with six or more tillers per plant. It can also be applied to mixed grass stands with alfalfa. Prowl H2O will only control weeds that have not yet germinated.